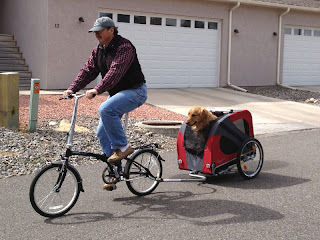 For Christmas this past year, Nan and I gave our little family the gift of transportation for our upcoming adventure living on our boat in Isla Mujeres: folding bikes for us and a dog trailer for Scout. Since then, the weather has been so lousy that we haven't been able to try them out, but we were able to take advantage of a beautiful Saturday afternoon last weekend. The bikes and trailer unfolded smoothly, and I had them set up and ready for a test ride in no time. Nan escorted Scout on his leash to the zipped-open back of the trailer, but he was having none of it. It didn't help that when I lifted his front paws into the trailer, the weight shift caused the attached bike to crash over on its side, which spooked Scout pretty badly. Then Nan came up with a brilliant idea: put him in through the front of the trailer instead. I unzipped the main front flap, lifted Scout and placed him inside the trailer. The angled front is what makes this possible. I held him in place while I attached his collar loop to the trailer's inside harness, then I pushed his head through the smaller opening, zipped shut the larger opening, and he was ready to go. Nan and I walked the bike and trailer for a few yards, and the motion didn't freak Scout out, so I got on the bike and started riding. It was a little awkward pulling the heavy load, but it worked just fine until I tried to go up a hill. The bikes are single-speed, and I stood to put pressure on the pedals, causing the trailer to jerk with each downward pedal. Scout freaked out, spinning around in the trailer. I got off the bike and walked it the rest of the way, and Scout calmed down. With a little practice and some positive experiences, I think we can get Scout to ride comfortably in the trailer, which will make transportation on Isla Mujeres faster and give us a wider range than walking would. Who knows, maybe he'll even learn to enjoy it. For the nearly three years we have owned Whispering Jesse, our 1980 Valiant 40, I have planned to replace the installed Webasto diesel heating system with a Webasto central air conditioning system. My thinking has been that I could just reuse the existing vents and ducts, and replace the one unit with the other. The only problem I could see was the expense. The air conditioning unit, seawater intake kit and basic duct work would add up to almost $2400, plus installation, which could easily run another $2000. I was talking on the phone with my father about boat projects a few weeks ago, and he asked me why I wasn't considering a portable air conditioner like the ones he had seen at Best Buy. I told him we had personal experience with one in Isla Mujeres when our rented apartment's main air conditioner stopped working. It wasn't very effective. 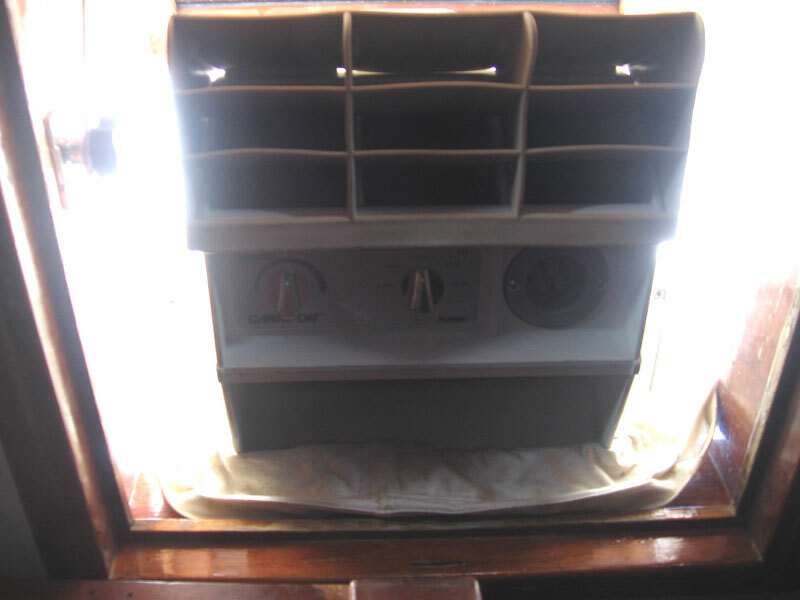 But my father's idea got me thinking about the air conditioners I have seen on sailboat cabin tops blowing cool air in through open hatches. After I got off the phone, I checked West Marine's website and found that they carried their own model that did exactly that, but it was over $1700 after you added in the cloth hood and rubber air deflector. Searching the Web, I discovered that the original model was produced by Cruisair. I went to eBay on a whim to see if there were any used ones for sale and was surprised to find three of them. I put in a bid on the one that appeared to be in the best condition, the seller offered a counter-bid, and I accepted it. It was a good deal at less than a third the price of the West Marine one, even with the expensive shipping--it weighs almost eighty pounds! I had it shipped to my folks' house in Savannah so I could try it out on the boat while I was out there. I'm happy to report that the new (to us) Cruisair air conditioner works well. After lugging the unit into place at the most central hatch, located just forward of the mast, I covered the open hatch and unit with the included hood, plugged in the power cord and turned the unit on from inside the cabin, where the controls are located. Cool air poured out immediately, and the fan noise was not too bad, like light white noise. When I went up on the deck to check the unit from that angle, I noticed that there was water around it on the deck, which would be expected from condensation, but it was minor and would be drained off by the scuppers. I could see only two issues I would need to resolve. The first was that the hood did not fit snugly around the base of the hatch, but I think I can fix that with some bungee cords. The second was that the unit was not level due to its position at the lip of the hatch, though it probably needed to be if the bubble level on the top of the case was any indication. I found a block of wood in the marina dumpster left over from a recent construction project and put it under the forward edge of the unit. The bubble leveled right out. When it's not living on the deck, the air conditioner will need to be manhandled down into the cabin and stored in the V-berth, which will end up being more of a large closet than a possible guest room once we get where we are going. 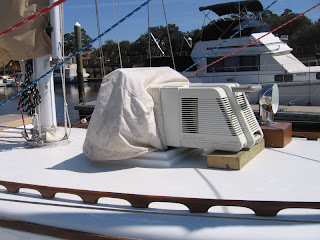 My hope is that the air conditioner, in combination with sun shades rigged above the decks, will keep us tolerably cool in tropical marinas, especially at night when we're trying to sleep. We will see. Hello from Savannah. I arrived here Saturday morning on the red-eye from points west. The weather has been mostly cool and windy, which has kept me off the golf courses and focused on boat projects. On Sunday, I was able to get the Aries wind vane removed from Whispering Jesse's stern, as the photo I took yesterday shows. 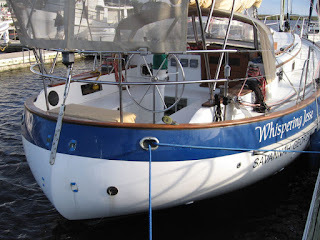 It required turning the boat diagonally in its slip for pier access to the stern and then squeezing down inside the starboard lazarette with a wrench to keep the nuts from spinning while Billy and Garrett from the marina ratcheted off the bolts from the outside. We managed to remove the entire apparatus without dropping it or any tools into the water, which was more difficult than it sounds. It was critical to remove the wind vane as my first project because Ray, the boat's previous owner, was driving down from Pennsylvania on Monday to pick it up. A gentleman from Atlanta had expressed an interest based on my previous blog post but later changed his mind. I thought I would end up advertising it for sale on Craigslist, but then Ray contacted me out of the blue. He has a new "project" sailboat and wanted wind vane self-steering for it, something he is very familiar with from his twenty years of experience with the Aries on his previous boat, which is now my boat. We reached a favorable deal and he mailed me a check. It was good to see Ray. 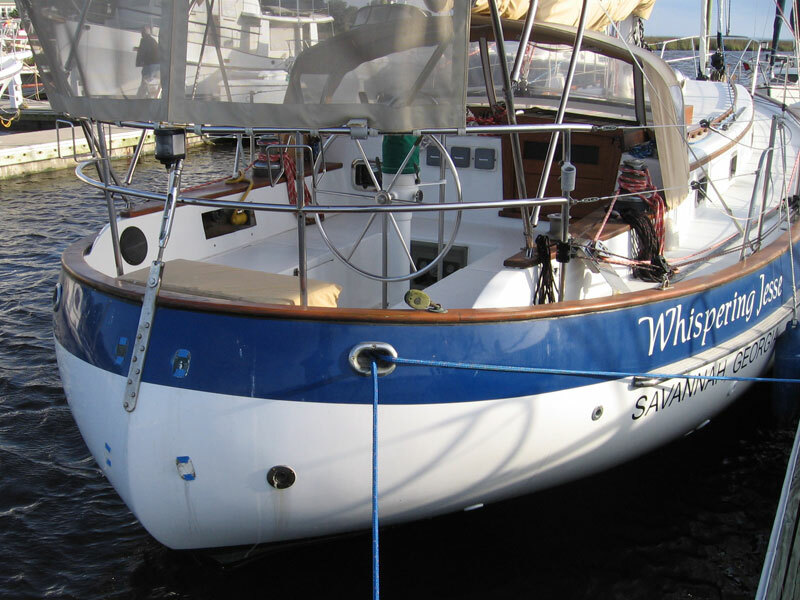 We had met only briefly in May 2010, when we took the boat, then named Little Walk, for a sail in Chesapeake Bay, along with Bob the broker and my friend John Kretschmer, who flew up from Fort Lauderdale to help me evaluate the boat for purchase. Ray had given me a thorough tour then and filled my head with too many details about the boat's many systems. Seeing him again after three years of ownership was an opportunity to get answers to my many questions. Ray was pleased with the refit work. He stopped on the pier to admire his old boat in the last light of day and then breathed in its smell from the foot of the companionway steps. We dropped off his duffel bag and sleeping bag in the aft berth, where he would be spending the night, and took a brief look around the cabin. He lifted the bilge covers and had me flip the bilge pump switch to manual to clear a small accumulation of water, though we were unsure why it had not cleared with the switch set to automatic. I told him the refrigeration was not working well, and he showed me how to tell if the compressor was kicking in. We adjusted the rheostat in the fridge to the mid-point and checked the thermometer I had hanging in there, with the idea of checking it again when we returned from dinner. The fridge was a few degrees cooler when we returned but still not cold enough to make ice. We turned on the cabin lights and used a flashlight to check the Webasto diesel heating system. Ray had installed it when he was living on the boat through the winter in Boston Harbor many years ago, but Nan's and my future sailing plans are much more tropical, so I told him I would be taking it out and putting in an air conditioner instead. He told me to take care with the removal of the components because they would have good resale value. If any readers are interested, please contact me by email using the address under "View my complete profile", or it may be time to consider Craigslist again. Earlier on Monday, I met at the boat with Kevin, a project manager from Thunderbolt Marine, to discuss some boat projects that are beyond my abilities. The first was the removal of the Webasto system, but now it's a couple of days later and I already have two of the five heat exchangers removed. I expect to have the other three removed by the end of the day today. But I will still need some professional help getting the main unit out of the starboard lazarette, replumbing the fuel line, and closing off the exhaust through-hull. Kevin and I also discussed the refrigerator and several installations: the Garmin chartplotter and antenna I purchased during my last trip to Savannah; a marine-grade carbon monoxide detector; two or three cigarette-lighter-type electrical adapters; and a macerator pump for overboard pump-out of the head's holding tank. Kevin's specialty is fiberglass and paint, and he had some good ideas as we walked around the boat looking at various dings and scrapes that need touching up, including the four new scars on the stern where the wind vane used to be. CORRECTION: I discovered this afternoon that the people who installed the new engine took out the heat exchanger that was in the engine room, so there are four now, not five. And I am happy to report that they have all been removed. Ah, storage space!